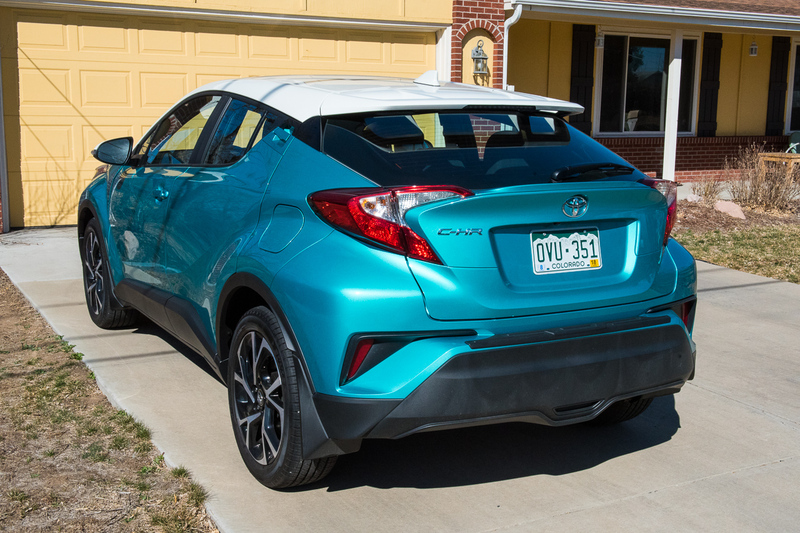 Upon first impressions the C-HR doesn’t look like a typical Toyota. It’s loud, its design is fussy and dissonant and it looks like it just drove up from Malibu. Which brings us to the first thing you need to know about this crossover: it was initially slated to be a Scion. But Toyota killed the Scion brand, so the C-HR now wears a Toyota badge. Whatever the response, I don’t think any car I’ve reviewed has elicited as many unsolicited responses as the C-HR. And this appears to be exactly what Toyota is aiming for. The car certainly isn’t boring and you will definitely get noticed driving it. Another thing unique to the C-HR among crossovers? All-wheel drive is not offered, even as an option. In an increasingly AWD crossover obsessed market, this seems like a miss. 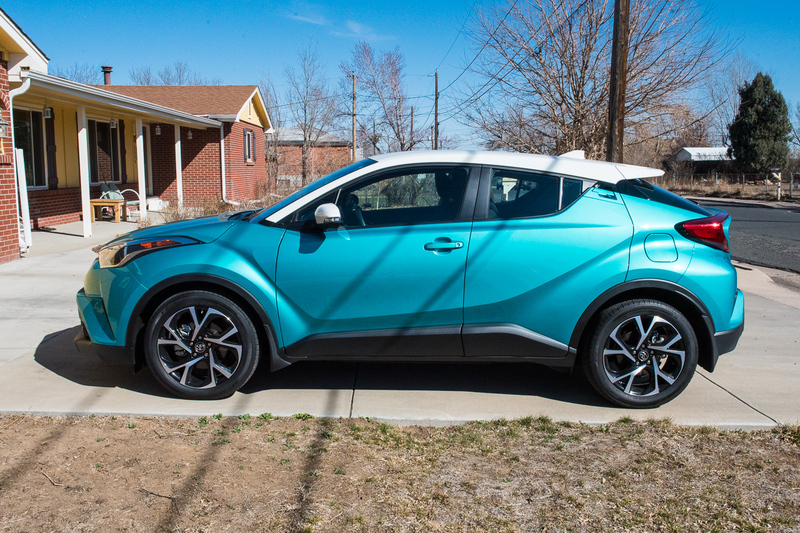 The Coupe High-Rider (C-HR) does look a little more subdued in less beachy colors, if loud isn’t your thing. There are eight colors beyond the Malibu inspired blue color my tester came dressed in. The front has a bit of an underbite with LED lights that stretch from front center over the wheels to the doors. And the buffed out wheel arches and rocker panels clad in black are reminiscent of a Subaru Outback. This isn’t a crossover that’s pretending to have off-road chops, I like the honesty. The wide, tall rear is where things get weird. 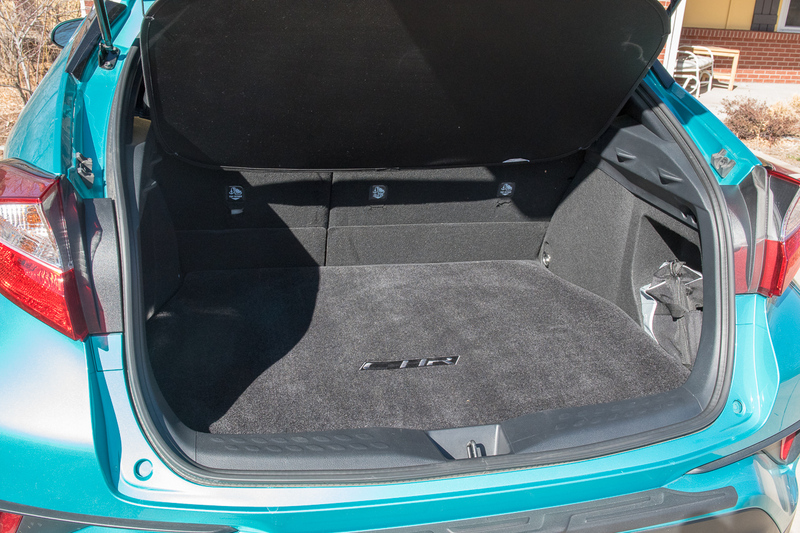 The rear doors feature door handles that are hidden high up where the roof line, corner of the door and “spoiler” meet. 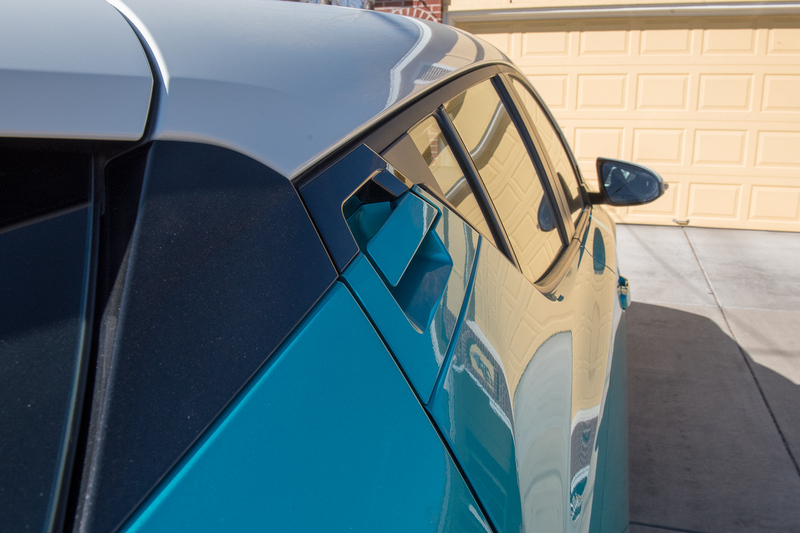 That spoiler/wing thing also houses the third brake light, below it is the steeply slowing rear window which is flanked by a pair of large wrap-around rear lights. Behind the wheel the first think you notice is that the C-HR feels more like a hatch than a crossover thanks to it’s low height and stretched wheelbase. This translates into a pretty decent ride as the low center of gravity keeps the body roll seen in most crossovers to a minimum. Thanks to its hatch like drive characteristics and some nicely bolstered seats the C-HR was actually fairly fun to drive through some winding, hilly backroads. 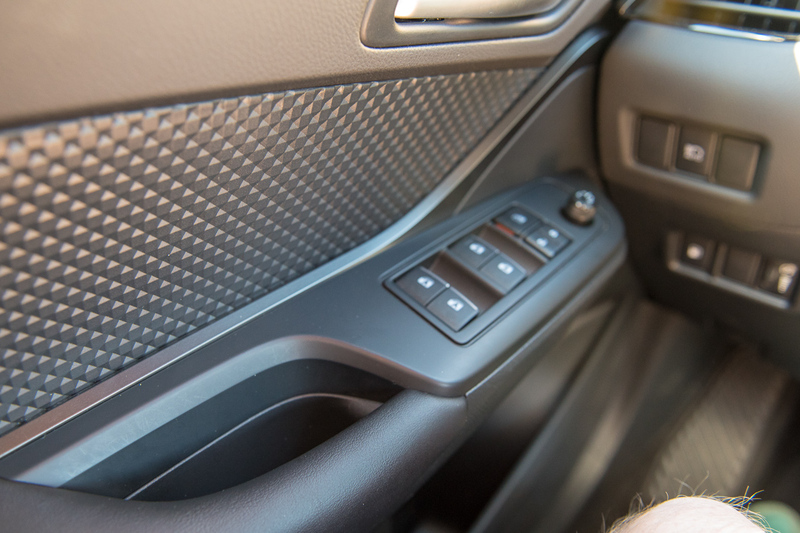 The other thing you notice behind the wheel is the continuously variable transmission (CVT). It drones quite a bit during acceleration, especially above 4000 rpm, before it finds its zone and calms down. 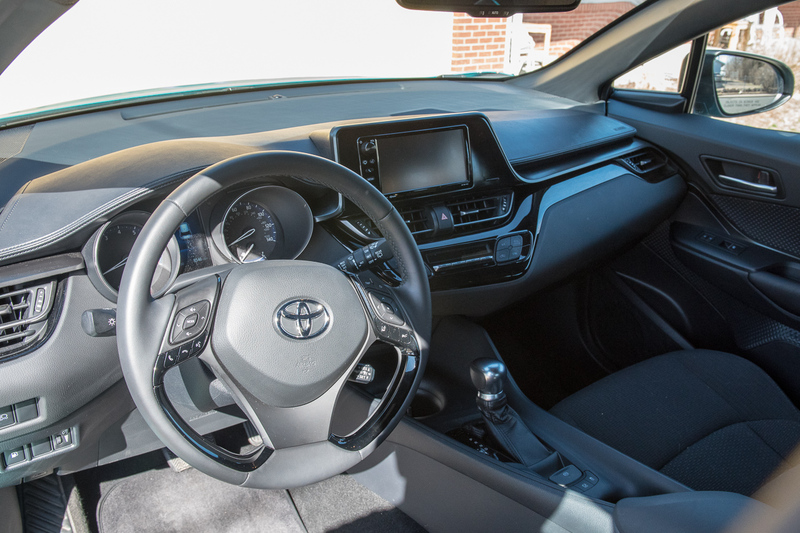 Toyota does offer a “manual” style shift option for virtual shifting, but I don’t find it all that convincing. 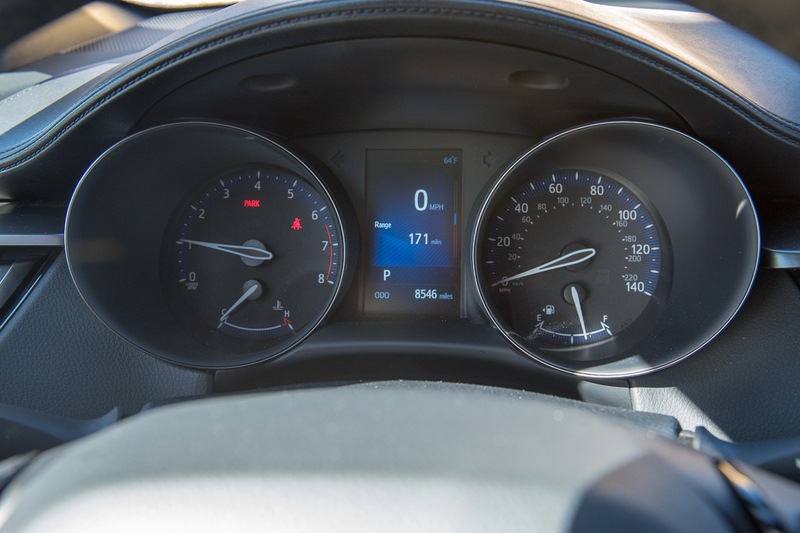 Where the CVT shines is in fuel economy. 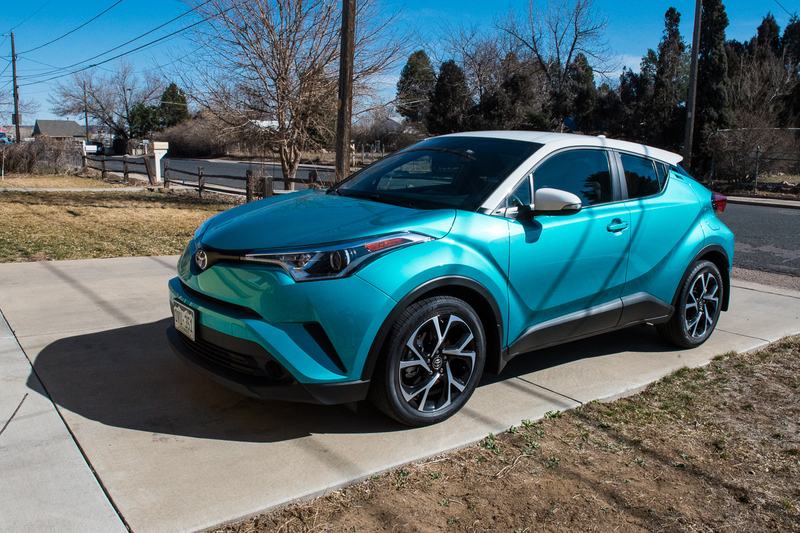 The C-HR gets 29 mpg combined. The 144-horsepower four-cylinder engine is responsive, but never quick. The C-HR will get from 0 to 60 in about 10.5 seconds. At altitude the engine felt a bit anemic. 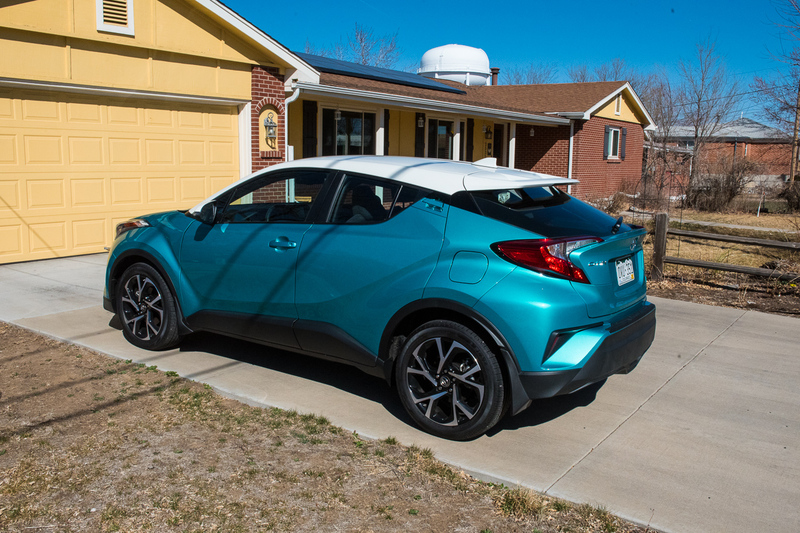 The C-HR is a great value. At $23,000, Toyota has priced the vehicle to move. 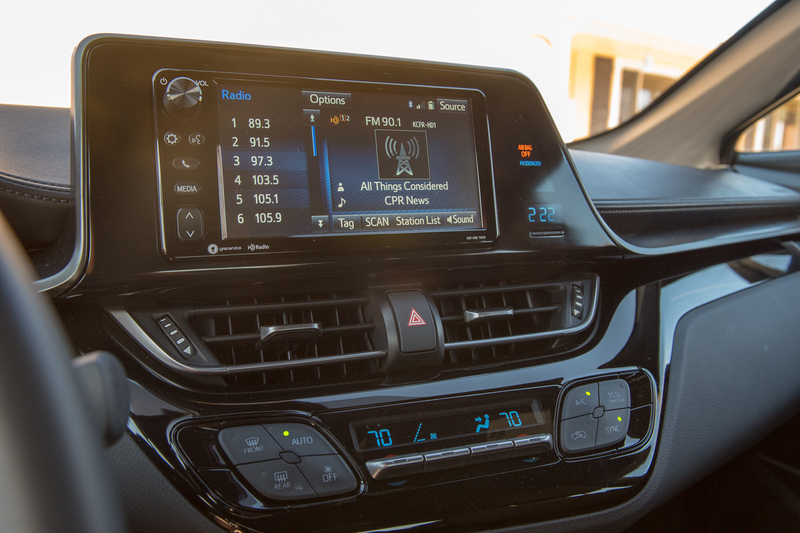 It comes standard with advanced safety equipment like pre-collision braking and adaptive cruise control. Both are features rarely seen at this price point. It’s not all sunshine and rainbows in the cabin though, the gauge cluster left me a bit underwhelmed and Toyota’s Entune infotainment system needs some serious TLC. 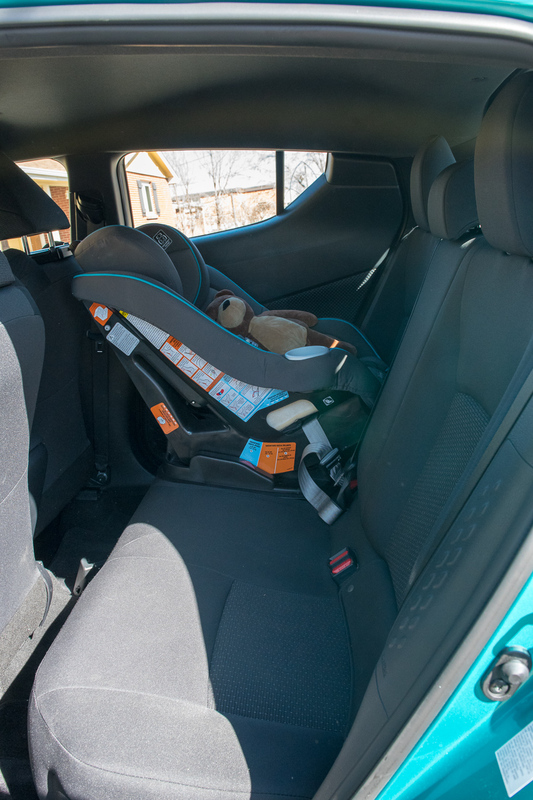 Overall though, for a $23k vehicle it’s a pretty comfortable and well appointed place to be. In a world of cookie-cutter crossovers, the C-HR stands out. Whether or not it stands out in a way that appeals to you is going to vary widely. Regardless, the vehicle is worth a look if you’re shopping the budget crossover market. Nice entry for a review about Toyota CHR. Keep it up man! And hey, let’s follow, and share each other to grow together. Thanks!